The present study was designed to evaluate the effects of synthetic ACTH (1–24, tetracosactid) and porcine CRH on the plasma levels of cortisol and PGF2α metabolite in cycling gilts (n = 3) and castrated boars (n = 3). The experiments were designed as crossover studies for each gender separately. Each animal received, during three consecutive days; 1) ACTH (Synacthen® Depot) at a dose of 10 μg/kg body weight in 5 ml physiological saline, 2) porcine CRH at a dose 0.6 μg/kg body weight in 5 ml physiological saline or 3) physiological saline (5 ml). The test substances were administered via an indwelling jugular cannula in randomized order according to a Latin square. The administration of ACTH to cycling gilts resulted in concomitant elevations of cortisol and PGF2α metabolite with peak levels reached at 70.0 ± 10.0 and 33.3 ± 6.7 min, respectively. Similarly, the administration of ACTH to castrated boars resulted in concomitant elevation of cortisol and PGF2α metabolite with peak levels reached at 60.0 ± 0.0 and 20.0 ± 0.0 min, respectively. Cortisol peaked at 20 min after administration of CRH in both cycling gilts and castrated boars with maximum levels of 149.3 ± 16.5 nmol/1 and 138.3 ± 10.1 nmol/1, respectively. It can be concluded that administration of synthetic ACTH (tetracosactid) to pigs caused a concomitant elevation of cortisol and PGF2α metabolite levels in both cycling gilts as well as castrated boars. The administration of CRH to pigs resulted in an elevation of cortisol levels in both cycling gilts and castrated boars. Conversely, PGF2α metabolite levels were not influenced by the administration of CRH either in cycling gilts or in castrated boars. Corticotropin releasing hormone (CRH) plays a central role in regulating the release of adreno-corticotropic hormone (ACTH) during a stress response. ACTH acts on the adrenal glands, inducing the secretion of cortisol. In our previous study, we reported that ACTH administration to ovariectomized gilts results in the plasma elevation of cortisol, progesterone and prostaglandin F2α metabolite . How ACTH is capable of stimulating the secretion of PGF2α metabolite remains unanswered. However, it was previously suggested by  that ACTH enhances the conversion in vitro of 3H-arachidonic acid to prostaglandins in feline adrenocortical cells. The findings of  indicate that prostaglandins in the brain interact in their stimulatory regulation of ACTH secretion. Such an interaction may also be involved in prostaglandins mediation of the ACTH response to immunochallenges. reported that stimulation of porcine pituitary cells by relatively low concentrations of prostaglandin E2 support increased secretion of ACTH but exposure to greater concentrations of this prostaglandin in fact suppresses ACTH secretion. Food deprivation, which is a form of stress, has been shown to result in the plasma elevation of both cortisol and PGF2α metabolite [24, 11, 14, 17]. Intracerebroventricular as well as intravenous injections of CRH resulted in an increased plasma cortisol concentration in pigs [20, 7]. Previously, it was suggested that CRH may also act directly or indirectly to enhance cortisol secretion beyond the level achieved through adrenal stimulation by ACTH . The objectives of the present study were to evaluate the effects of synthetic ACTH (tetra-cosactid) and porcine CRH on the plasma levels of cortisol and PGF2α metabolite in cycling gilts and castrated boars. Six crossbred pigs (Landrace × Yorkshire; three gilts and three castrated boars) aged approximately 6 months weighing between 110 and 125 kg were used for this experiment. The pigs were brought to the Division of Comparative Reproduction, Obstetrics and Udder Health, and were housed in individual pens. The stable had a light period of 12 h starting from 06:30 h and the room temperature varied between 20 and 23°C. The pigs were fed according to the Swedish breeding stock standard . The gilts were stimulated by boars in the vicinity and were expected to come in oestrus within the first week after arrival. After the second oestrus, the experiments were carried out in the early luteal phase (days 5–10). The gilts were checked twice daily at 06:00 h and 18:00 h for signs of oestrus in the presence of a fertile boar by back- pressure test. All the six animals were vein-cannulated  at about one week before the experiments. The experiments were designed as crossover studies for each gender separately. Each animal received, during three consecutive days; 1) ACTH (1–24) (Synacthen® Depot, Novartis Pharma AG, Basel, Schweiz) at a dose of 10 μg/kg body weight in 5 ml physiological saline, 2) porcine CRH (American Peptide Company, Inc., Sunnyvale, CA, USA) at a dose 0.6 μg/kg body weight in 5 ml physiological saline or 3) physiological saline (5 ml). The test substances were administered via an indwelling jugular cannula in randomized order according to a Latin square. On the day of the experiment, blood samples were taken at -40, -20 min and immediately before injection. Treatment was performed at 10:00 h (time = 0) and blood samples were taken 20, 40, 60, 80, 100, 120, 140, 160, 180, 210, 240, 270, 300, 330 and 360 min after injection. Blood was collected in ten ml heparinised tubes, centrifuged immediately and plasma stored at -20°C until analysed. The care of the animals and the experimental design of this study were approved by the Local Animal Ethics Committee in Uppsala, Sweden. Cortisol. Plasma cortisol was determined by radioimmunoassay (Coat-A-Count Cortisol, Diagnostic Products Corporation, Los Angeles, CA, USA) according to the manufacturer's instructions. Serial dilutions of porcine plasma with high concentrations of cortisol produced displacement curves parallel to the standard curve. The intra-assay coefficients of variation calculated from 5 assays were 22% at 14 nmol/1, 14% at 28 nmol/1 and decreased below 8% for concentrations between 138 and 552 nmol/1. The inter-assay coefficients of variation for three control samples were 13% (33 nmol/1), 9% (74 nmol/1) and 9% (541 nmol/1). The average detection limit of the assay was 7 nmol/1. Prostaglandin F2α metabolite. The main initial blood plasma metabolite of prostaglandin F2α, 15-keto-13, 14-dihydro-PGF2α (15-ketodihydro-PGF2α), was analysed by radioimmunoassay according to . The relative cross-reactions of the antibody were 16% with 15-keto-PGF2α, and 4% with 13,14-dihydro-PGF2α. The intra-assay coefficients of variation ranged between 3.4 and 7.6% for different ranges of the standard curve and the inter-assay coefficient of variation was around 14%. The practical limit of sensitivity for the assay analyzing 0.2 ml of plasma was 60 pmol/1. Data were examined by analysis of variance using MIXED procedure according to SAS package . Additionally, the area under the curve, peak value, time and duration of the peak were calculated for each animal according to the GraphPad Prism version 3.02 for Windows (GraphPad Software, San Diego, CA, USA). Data are expressed as means ± S.E.M. Probabilities less then 0.05 were considered significant. No significant (P > 0.05) differences were seen in the pretreatment plasma levels of cortisol or PGF2α metabolite between the saline, ACTH and CRH treated cycling gilts (Figures 1 and 2). 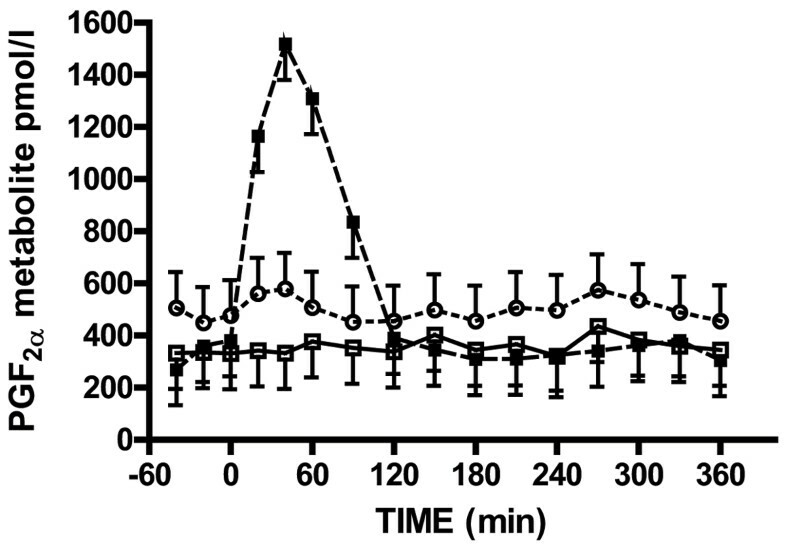 The administration of ACTH to cycling gilts resulted in concomitant elevations of cortisol (Figure 1) and PGF2α metabolite (Figure 2) with peak levels reached at 70.0 ± 10.0 and 33.3 ± 6.7 min, respectively. The durations of the peaks were 153.3 ± 28.2 and 103.2 ± 11.4 min, respectively and their maximum concentrations were 270.7 ± 16.5 nmol/1 and 1517.7 ± 137.2 pmol/1, respectively. Plasma cortisol concentrations (LSmeans ± SEM) in cycling gilts given the injection (time = 0) of saline (□, n = 3), ACTH (■, n = 3) and CRH (○, n = 3). Plasma PGF2α metabolite concentrations (LSmeans ± SEM) in cycling gilts given the injection (time = 0) of saline (□, n = 3), ACTH (■, n = 3) and CRH (○, n = 3). No significant (P > 0.05) differences were seen in the pretreatment plasma levels of cortisol or PGF2α metabolite between the saline, ACTH and CRH treated castrated boars (Figures 3 and 4). 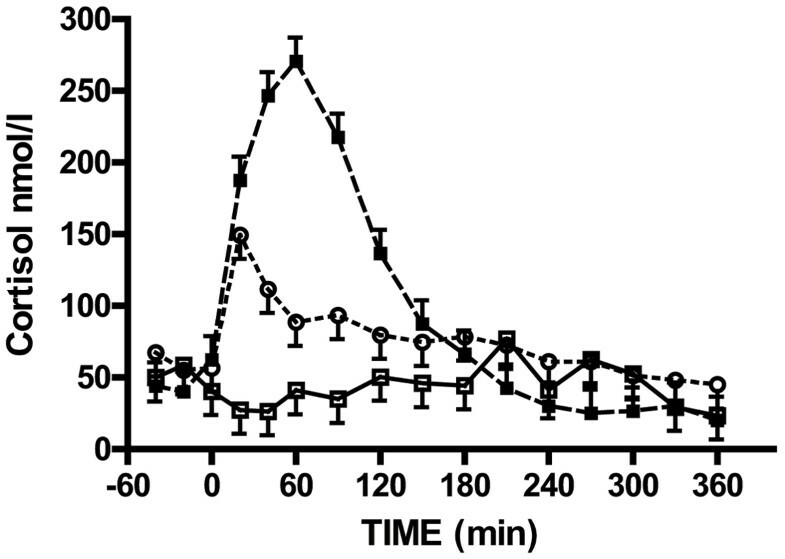 The administration of ACTH to castrated boars resulted in concomitant elevation of cortisol (Figure 3) and PGF2α metabolite (Figure 4) with peak levels reached at 60.0 ± 0.0 and 20.0 ± 0.0 min, respectively. The durations of these peaks were 199.1 ± 30.0 and 86.3 ± 13.8 min, respectively and their maximum concentrations were 289.0 ± 10.1 nmol/1 and 1262.3 ± 53.2 pmol/1, respectively. 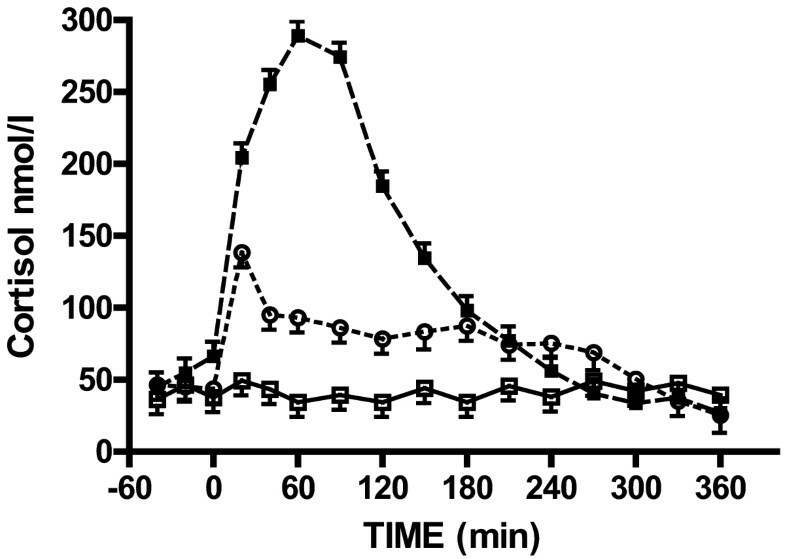 Plasma cortisol concentrations (LSmeans ± SEM) in castrated boars given the injection (time = 0) of saline (□, n = 3), ACTH (■, n = 3) and CRH (○, n = 3). 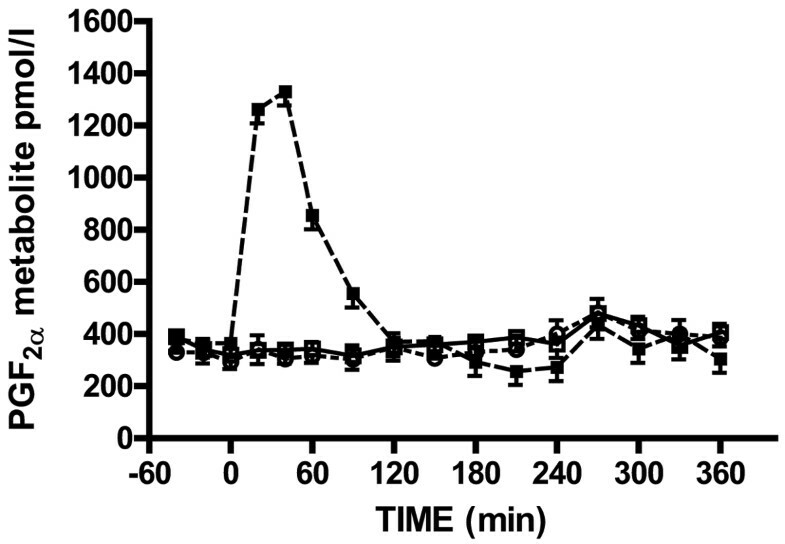 Plasma PGF2a metabolite concentrations (LSmeans ± SEM) in castrated boars given the injection (time = 0) of saline (□, n = 3), ACTH (■, n = 3) and CRH (○, n = 3). The administration of CRH to both cycling gilts and castrated boars resulted in the cortisol peak 20 min later with maximum levels of 149.3 ± 16.5 nmol/1 (Figure 1) and 138.3 ± 10.1 nmol/1 (Figure 3), respectively. The durations of these peaks were 57.3 ± 18.5 min and 255.2 ± 43.6 min, respectively. Prostaglandin F2α metabolite levels were not influenced by the injection of CRH either in cycling gilts or castrated boars (Figures 2 and 4). Physiological saline did not alter significantly either cortisol or PGF2α metabolite levels in any animal (Figures 1,2,3,4). No significant (P > 0.05) differences were seen in the measured responses between females and males. The present study clearly demonstrates that cortisol reach peak levels much lower and earlier in CRH (approximately after 20 min) than in ACTH (approximately after 70 min) treated cycling gilts or castrated boars. This confirmed earlier results by  who reported that the cortisol concentration peaked approximately 30 min after administration of CRH and approximately 60–90 min after administration of synthetic ACTH to dairy cows. The present study also demonstrates that the administration of ACTH stimulates a concomitant elevation of both cortisol and PGF2αmetabolite levels in both cycling gilts and castrated boars. In addition, peak PGF2α metabolite levels occur earlier than peak cortisol levels. Apparently, it takes approximately twice the time for cortisol than for PGF2α metabolite to reach peak levels following ACTH administration. This is consistent with our previous findings in ovariectomized gilts  and suggests that ACTH stimulates the secretion of PGF2α earlier than cortisol. The frequency of blood collection may have impact on the occurrence of PGF2α metabolite peak in relation to cortisol peak. When blood samples were taken only at 1-h intervals, both PGF2α metabolite and cortisol peak were seen one hour after ACTH administration in recently ovulated sows . have demonstrated that daily administration of ACTH from day 13 to day 16 of the oestrous cycle in multiparous Welsh Mountain ewes suppressed the levels of PGF2α metabolite. They further showed that in ovariectomized multiparous Welsh Mountain ewes, primed first with progesterone and then with oestradiol-17β, ACTH reduced the ability of oxytocin to cause the release of PGF2α into the peripheral circulation. However, there is evidence that feline and rat adrenocortical cells synthesise prostaglandins F2α and E2 and that the total prostaglandins synthesis is stimulated by ACTH [9, 4]. demonstrated that in vitro, the cytokine interleukin-1 enhances the conversion of 3H-arachidonic acid to prostaglandins by cultured bovine adrenal cells. The secreted prostaglandins i.e. PGD2, PGF2α and PGE2 were in turn found to stimulate cortisol secretion. Furthermore,  reported that intravenously administered PGE1, PGE2 or PGF2α had significant ACTH-releasing activity in the rat and suggested that prostaglandins are playing a role in regulating the hypothalamo-pituitary-adrenal axis. In sows, injection of PGF2α after ovulation resulted in a dramatic cortisol elevation, which lasted approximately 1.5 h .
In contrast to ACTH-treated pigs, no peak PGF2α metabolite levels were seen in any CRH treatment. We can speculate that a combination of CRH and lysine vasopressin (LVP) could have been a better option since LVP + CRH was seen to have a better ACTH response than CRF or LVP alone in pigs . It might also simply indicate that CRH does not stimulate the secretion of PGF2α. Interestingly, food deprivation which is a form of stress has been shown to result in the plasma elevation of both cortisol and PGF2α metabolite [11, 14, 17, 24]. It is postulated  that in food deprived animals, PGF2α metabolite levels are elevated owing to increased levels of free fatty acids that includes arachidonic acid, the precursor of prostaglandin synthesis. In addition,  reported that during artificial insemination of sows housed in crates, a dramatic elevation of cortisol levels was seen before PGF2α metabolite reached its maximum. It is still unclear what role if any ACTH plays either directly or indirectly in the stimulation of PGF2α production. It can be concluded from the present study that the administration of synthetic ACTH to pigs at a dose of 10 μg/kg body weight caused a concomitant increase of cortisol and PGF2α metabolite levels in both cycling gilt as well as castrated boars. The administration of CRH to pigs resulted in an elevation of cortisol levels in both cycling gilts and castrated boars. Conversely, PGF2α metabolite levels were not influenced by the administration of CRH either in cycling gilts or in castrated boars. This work was supported financially by the Swedish Council for Forestry and Agricultural Research, Swedish Farmers Foundation for Agricultural Research and SLU's Research Programme "Animal Welfare for Quality in Food Production"